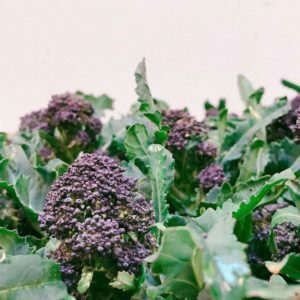 Unlike the more recognisable calabrese broccoli, purple sprouting broccoli is available from the UK throughout the winter months and is both versatile and easy to cook with. Our supply of this staple brassica comes from Duncan Gielty in Ormskirk and Francis Sampson in Penzance, look out for the violet plumes and dark green leaves. To prepare, separate the stalks from the florets and leaves. Steam, boil or fry the stalks for a minute first then add the purple bits for a minute longer. Try a dressing of tahini, lemon and oil or add to pasta with a little garlic and dried chilli. This miserable weather calls for some sunshine fruits; persimmon have hit a high note this week – tasting wonderfully sweet with a smooth, juicy flesh and they’re good value too. Chirimoyas – or custard apples – are at peak creaminess and star ruby grapefruits from Sicily growers Agricoop are sweet, fragrant and full of pep. For marmalade makers, we’ve the first arrival of Seville oranges and Citron lemons too.